Organizing a CIA-Meeting is probably the greatest challenge in the life of an allergy researcher! Not that it would be difficult to acquire good or excellent speakers - no they all are eager to come - the real problem is to manage the increasing quantity of excellent quality people and keep the meeting at the same time small, cozy, leisurely just as we have been used to it in the past, never having the feeling that the program is "crowded". While in former times, there was a scientific committee who made up the program, this time it was the whole council of the CIA who was involved in the process. For the first time, all members were asked for suggestions for speakers and subjects. There was a tremendous echo and the council had to put in a great effort to bring most of these suggestions together. As organizers we have learnt a lot about people and especially research colleagues from this correspondence. It is always interesting to see, how people answer when they are asked for suggestions for speakers or subjects. Some (the modest) only name other people, some (the normals) name other people and among those also themselves with their favorite theme, and there is the third category (the self-convinced) who only name themselves. Some of them simply answered our question with "thank you very much for your kind invitation"! We think that excellent scientists are present among all these different categories of human nature and we tried to include them more or less equally in the program. 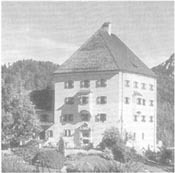 The place of the meeting is Schloß Fuschl near Salzburg. People of the CIA have been spoilt in the past by fantastic places like e.g. Sorrento, Puerta Vallerta, Martinique, Madeira, Capri, just to name a few! Furthermore the CIA has a strong affinity to water (fluidity of science?). A boat ride is a must, an island is expected. What can you do in Germany or Austria? For many years Rothenburg ob der Tauber was forwarded by one of the organizers as a typical medieval town, but when G. Marone came up with the Gulf of Napoli, even he voted for Capri. The attraction of a historic town in central Europe, however, stayed in the minds of the council, and by the combined effort of Austria and Bavaria we were lucky enough to decide for Schloß Fuschl, a castle on an peninsula. The boat ride will take place on the Wolfgang-See, a famous place in many aspects. So we were finally successful to bring the CIA to the Salzburg area and the alpine mountains. The organizers want to thank our president L. Lichtenstein and the whole council for their invaluable input in preparing the program (and at the same time for the liberty they gave to the organizers), to Rick Iber and Kate Anderson from our secretariat, to Mrs. Albasini from Schloß Fuschl, to Mrs. Lubenik and the members of the Vienna- and Munich-Group of the organizing committee. May this meeting be scientifically excellent and hilarious and friendly in spirit to keep up with the tradition of the Collegium Internationale Allergologicum!